If you’re looking for a small camcorder that’s packed with a lot of features, you won’t go wrong with choosing the JVC GY-HM170U Ultra 4K HD 4KCAM. It comes with automatic features that make it easy for amateurs to start shooting excellent videos right away, but it also comes with manual settings that give professionals full control over the device and allow them to tweak the camcorder as they see fit. So, whether you’ve been shooting videos professionally for years or are still starting out, the GY-HM170U will definitely meet your needs. The JVC GY-HM170U Ultra 4K HD 4KCAM is built with a powerful 1/2.3-inch 12.4 million-pixel CMOS sensor, which is paired with a 12x Ultra HD lens. This combination allows the camcorder to record clear, crisp, and sharp videos that capture all the details of your subject. The zoom can even be increased to 24x lossless zoom when you use Dynamic Zoom in HD mode, which means you can capture subjects that are located further away without losing video quality. The GY-HM170U can record 4:2:2 HD signals at 50Mbps at 60p, along with the traditional 4:2:0 AVCHD recording. It can also record 4K videos, which allows you to take video recording to the next level. Just use SDHC or SDXC memory cards, and you can take hours of 4K videos without having to worry about running out of storage. 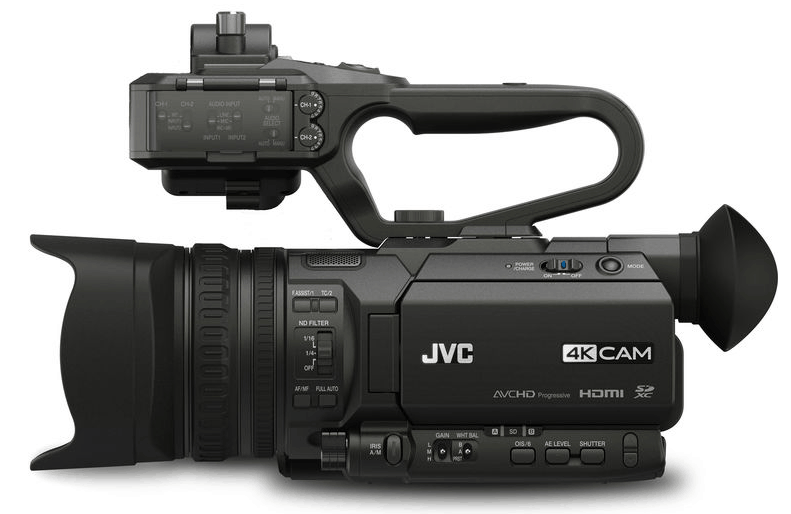 The GY-HM170U has similar features with JVC’s other camcorder GY-HM200. However, the two models are different in that the GY-HM200 is built with the latest IP communications engine (which allows remote control and monitoring from smartphones and other gadgets). It also has the ability to do HD-SDI video output and perform high-quality Live Streaming — something that GY-HM170U can’t do. Just like anything else, the JVC GY-HM170U Ultra 4K HD 4KCAM has several advantages and disadvantages that you should weigh before buying the device. Here are some of the pros and cons that you should know about. The GY-HM170U has dual SDHC/SDXC card slots and can do relay recording, which means it automatically switches to the other card when the first one is full. Since the cards are hot swappable, you can replace the full card with a blank card while the camcorder is still running, ensuring you can take virtually endless footage. Beginning October 2015, the GY-HM170U is shipped with a handle that’s designed to make audio connections. This is great when you want to pair the camcorder with a high-quality external microphone. The handle is removable, so you can get it out of the way and make the device lighter and more portable. The GY-HM170U comes with a 0.24-inch, 1.56M-pixel color viewfinder as well as a 3.5-inch, 920K-pixel LCD display. Both of these come with a smart focus assist function and make shooting videos an overall easier experience. Many users have complained that the GY-HM170U doesn’t perform well in low-light situations. 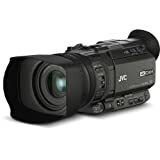 However, there are also those who point out that the camcorder has several manual settings that you can adjust to get excellent videos even in dark environments. The GY-HM170U has a plastic body that, according to several users, feel flimsy and weak, but it’s not a huge problem as long as you’re careful and avoid dropping the device. Many users state that the light plastic body is a plus since it makes the camcorder portable and easy to lug around. 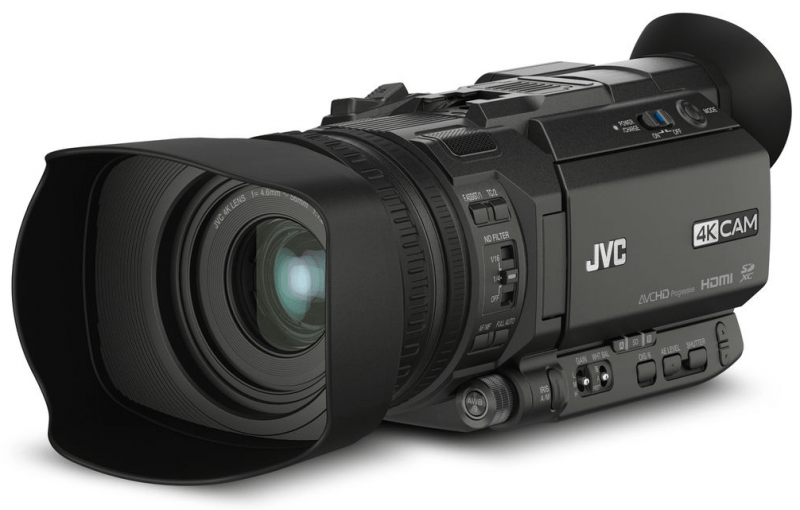 JVC GY-HM170U Ultra 4K HD 4KCAM comes with several features that are useful for both amateur and professional videographers. If you can get past its few drawbacks, you’ll love using this compact camcorder and enjoy the functionality it has to offer.